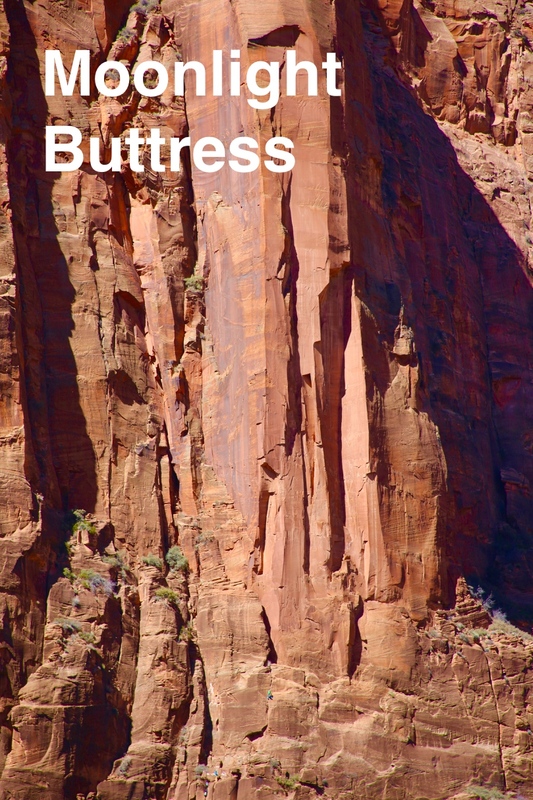 The iconic and gorgeous route, Moonlight Buttress. 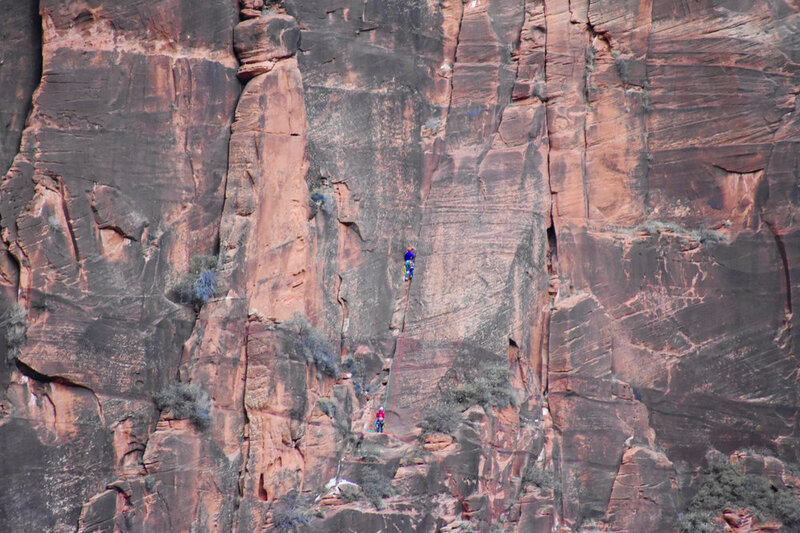 A climber in green can be seen leading the second pitch in the bottom center. 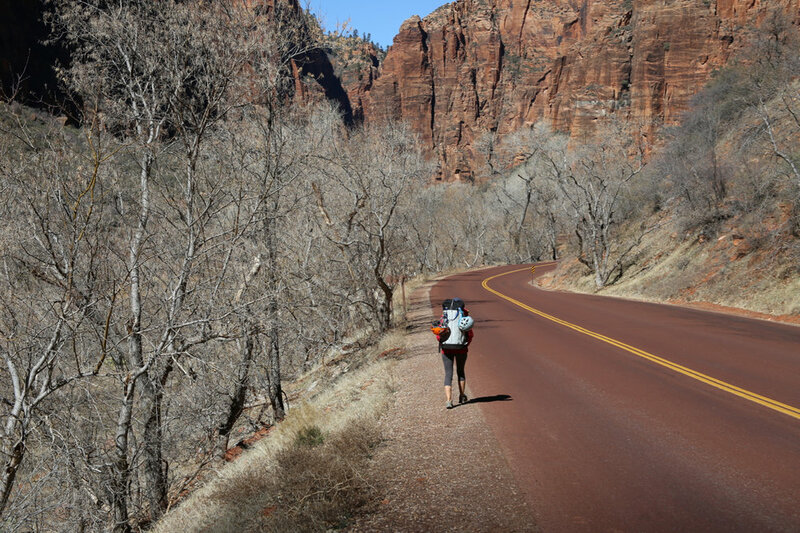 The routes we remember most are the ones that stretched our ability and psyche; the big, beautiful routes that sometimes deposit a pit in your stomach. 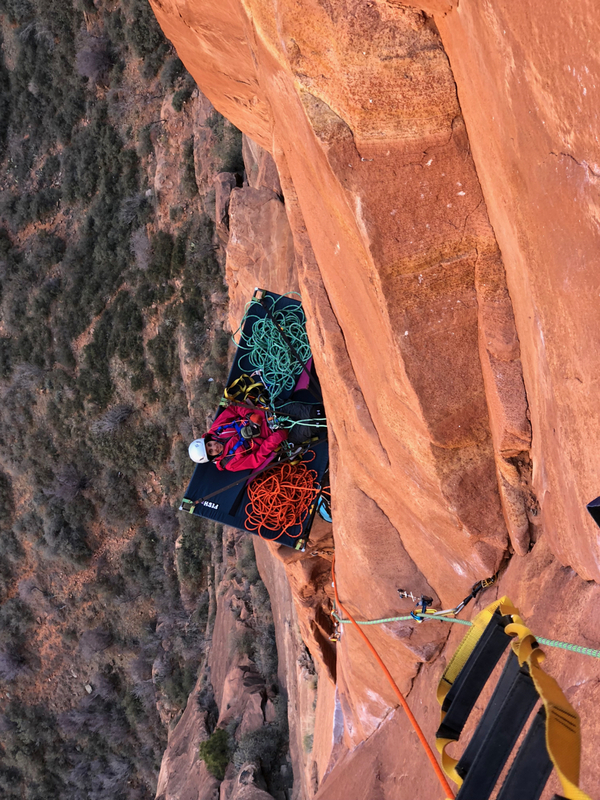 The routes where you focus all day, and sometimes get struck in wonder at the sheer beauty and lunacy of your position, and a sort of intense electricity runs along the rope between you and your partner. Sometime in 2016 we decided that we wanted to climb some long routes again. We wanted to feel that pit in our stomach, some 30 years after our last wall together. We went up on The Prow in Yosemite, but had a scary rockfall on the first pitch, and rapped off after 3 pitches. Coming back to it this year, we decided to climb Moonlight Buttress. It is perhaps the most perfect line we've ever climbed. Although plenty of people cruise up this route with ease, for us, in our late 50s, this would be plenty of route. Not technically difficult, but still plenty long and exposed. It has the nice benefit of being easy access - a simple approach and descent. The climbing still requires all the basic wall skills. We hoped to take our time, bivy on the wall, gaze at the stars and feel the sun in the morning. Our plan was to aid most of the route, and climb it early in the season. We were hoping to avoid teams working to free climb the route (this pian worked perfectly). Going in early March, we also were able to access the canyon before it was closed to private cars, which gave us more flexibility on the approach. Typically the canyon is closed to private cars starting the second weekend in March, and you must use the bus service which operates only during normal daylight hours. Karen checks out the route and approach. To keep the approach nice and easy, we carried up a load of gear on the afternoon before we started, leaving gear at the base of the route. We also picked up our bivy permit that afternoon. That allowed us to start early the next morning. Karen belaying and Don leading on the first pitch. The early morning temperature was well below freezing, making the moderate free climbing pretty interesting. The hauling was more difficult due to bushes and ledges. Have patience on the first pitch. While not difficult, it's probably the most complex pitch on the route, especially for hauling. Karen arrives at the second belay. Nice ledge here, and a shady alcove. Our plan to start early and do the route early in the season worked out well. There we no parties on the wall when we started up in cool, but excellent weather. Don starts up the third pitch bolt ladder. This pitch has a few mandatory free moves, but goes pretty easily and quickly. The pitch traverses about 50 feet or more. If you are hauling a bag, be prepared to lower the bag out. After this pitch, the hauling is simple and easy for the rest of the route. Two young climbers, Colin and Seth, followed us up the route. They were both doing their first wall, and their company was welcome. They were also aid climbing most of the route and moved about the same pace as us. Karen cleans the third pitch, which ends on the Rocker Block, a nice flat ledge about 3 by 4 feet. We planned to fix our ropes above and bivy here. We set up our ledge and took a break before starting up the fourth pitch. Starting up the amazing fourth pitch. 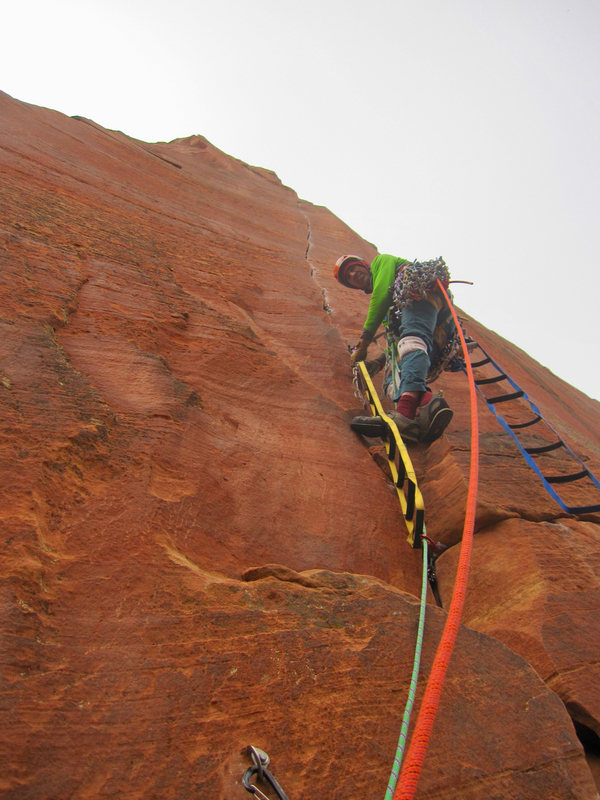 We fixed up to the first anchor on the fourth pitch and cleaned our gear on rappel. There is an anchor about 100 feet up, to the right of the crack, and another about 180 feet up, to the left of the crack. This made it easy to have plenty of gear to finish the pitch to the second anchor in the morning. The nights were long and cold in early March. Karen hanging out on the portaledge after a good first day. Don starts up the fifth pitch. Just above Don is the notorious flaring chimney. The chimney is not technically difficult, but is awkward and strenuous. A look at the chimney section of the fifth pitch. It's handy to have a #5 camalot for the wide crack below the bolt (the bolt is the fist piece clipped in this photo, right of the crack). We brought a #5 just for that purpose and it made the wide section go fairly easily. I back cleaned the #5 to minimize drag after I clipped the bolt. The climbing stays awkward and strenuous in the flaring section above the bolt, then eases up for 50 feet to a nice ledge at the top of the fifth pitch. At the anchor on top of the fifth pitch. This is a fantastic ledge and a great bivy spot. Starting the amazing sixth pitch on the upper headwall. Most of the route is finger sized cracks and has very secure placements. No matter how much gear your bring, you will need to leapfrog placements. We brought 9 0.5 purple camalots (or equivalent). We could have got by with fewer, but we used them all. Bring plenty of 0.4 and 0.75 sized cams too. Karen cleans the seventh pitch, which ends on the perfect 6 to 8 inch wide ledge shown here. The 6th and 7th pitches can be combined, but we split them up. We could have reached the summit from here, and had time, but decided to bivy here and finish the route in the morning. Starting up the 8th pitch in the morning sun. The 8th pitch ends at a hanging belay. We decided to keep going, and merge the 8th and 9th pitches. 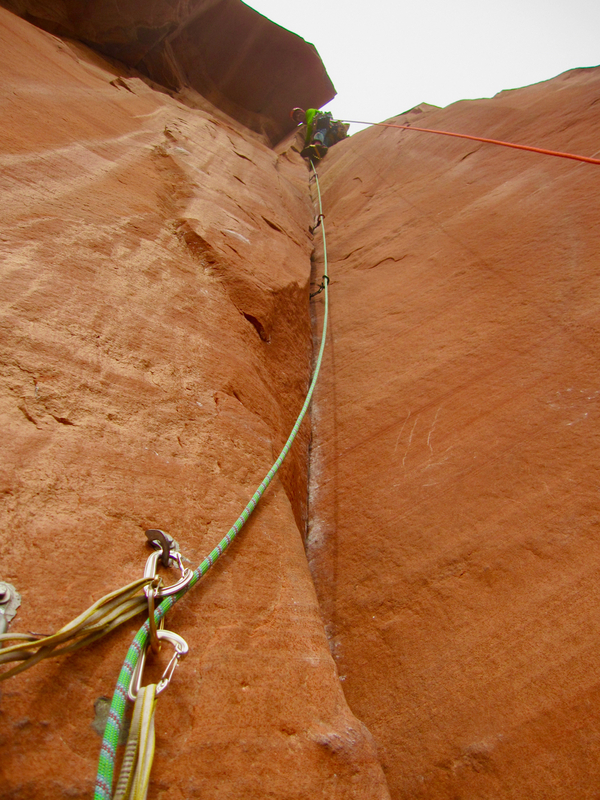 The 9th and final pitch ends at a belay right below the lip of the canyon (a fantastic final belay). Optionally, you can turn the lip and belay from a tree, but this adds drag and wear to the last haul. Karen leaving the anchor and jugging up the final pitch. Karen arriving at the final belay. The section pictured here is the final 5.7 free section at the top of the route. Packing up for the walk down. The descent trail is easy - you'll be at the trailhead in less than 2 hours. 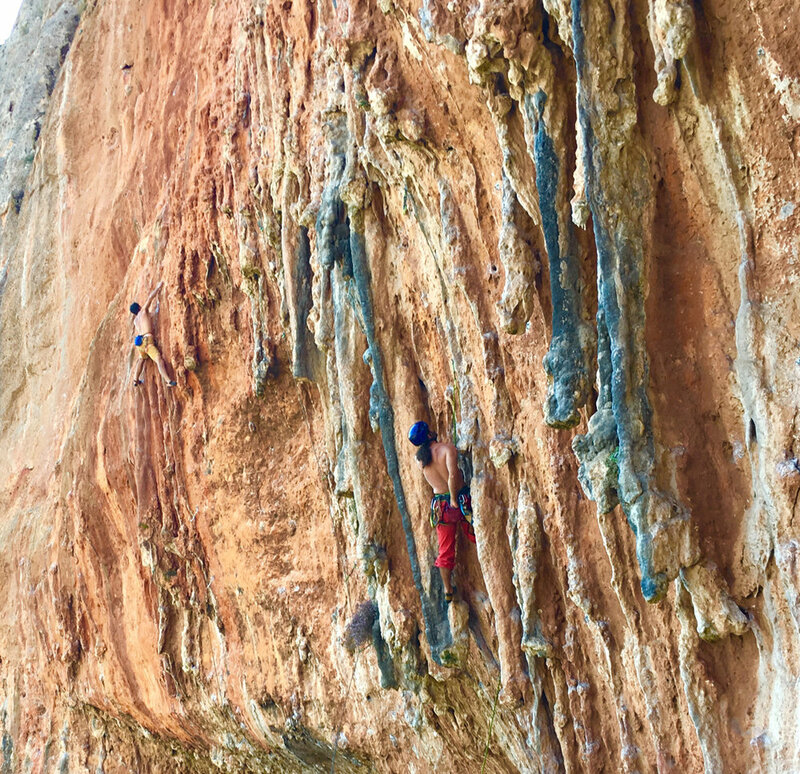 Last year we heard a few whispers about a fairly new climbing locale in Leonidio, Greece. Soon after, it graced the cover of Rock and Ice (in fall 2016), and we did a little more research. When we had about 16 days for a trip to Europe this fall, we figured we'd take a chance and spend our entire trip in Leonidio. 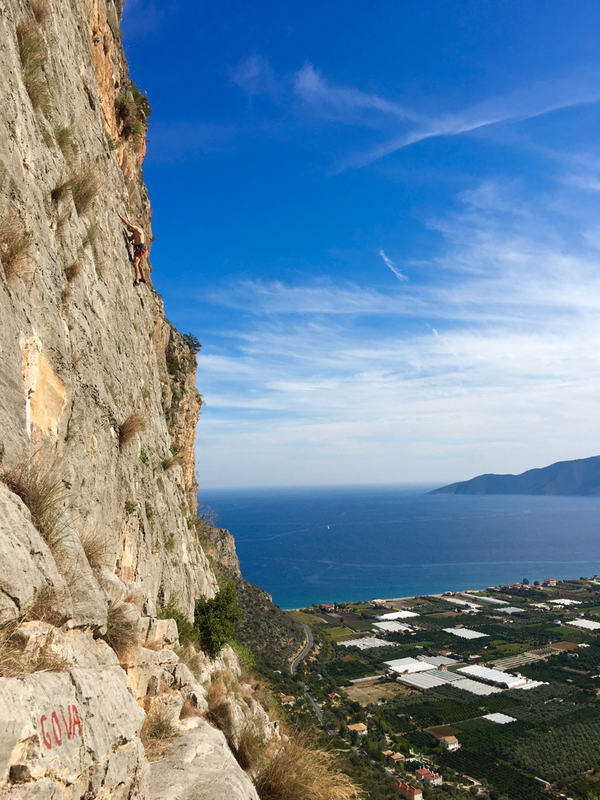 We had considered going to Kalymnos, but it's easier and less time consuming to get to Leonidio and we found the idea of visiting a new climbing area in Greece appealing. Karen looks out on the Myrtoon Sea after a day at the Sabaton Sector. Route development in Leonidio is ongoing at a rapid pace. The Sabaton sector is newly developed in 2017 and is not in the first edition of the local guidebook. The sector has 57 routes, nearly all day shade, steep rock, a 5 minute approach, a nice flat base in an olive grove, and a great view of the sea. Fly to Athens, rent a car, and drive to Leonidio. Pretty simple. Rental cars are cheap in Greece. The drive to Leonidio takes about 4 hours from the Athens airport. The first hour or so is on a toll road with shockingly little traffic (about €10 in tolls each way). After that you'll drop south on small roads, cross through a couple of moderate sized towns, and eventually drive along the beautiful eastern shore of the Peloponnessian peninsula. For a small town, Leonidio has quite a few options for places to stay. There are traditional hotels, apartments, small houses, rooms, and camping. Nearly all of the people that run these establishments will be familiar with climbers. During the fall. winter and spring, climbers make up the majority of the tourism in the town. 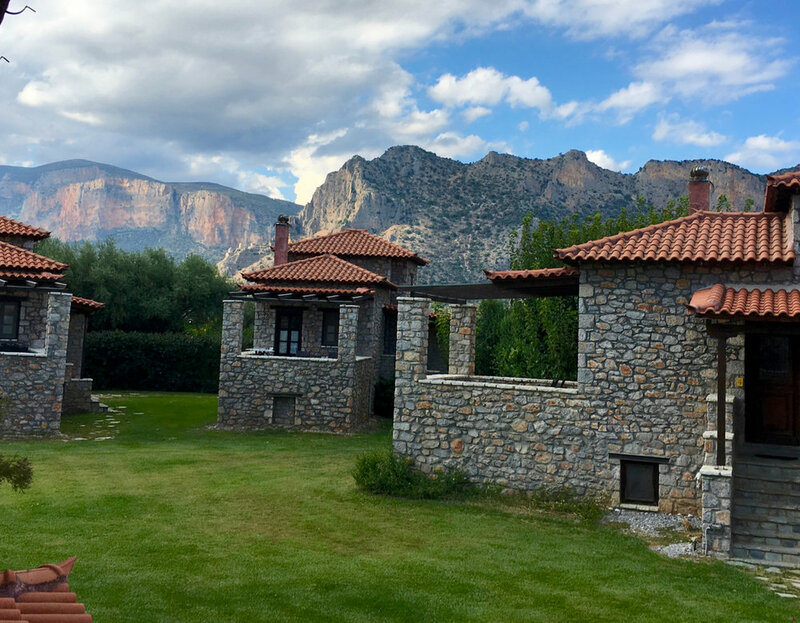 We stayed at Agroktima, a group of ten stone houses that are built in converted farmland. The houses are located about 2 km from town, along the road that runs from town down to the harbor. Agroktima is run by a local couple and is perfect for a climbing visit. Each house has a small living room, complete small kitchen, bed in a loft, and a nice porch. The rooms are clean and the service was super friendly and reliable. They'll bring you a basket of fresh local food every morning (included as part of your visit, no extra cost). The food is enough to easily feed two people for breakfast and lunch. Generally every day we got 4 to 5 oranges (there's a juicer in the kitchen to make your own fresh juice), breakfast pastries, two small loaves of bread, two fresh eggs, a tub of fresh yogurt with fruit, and two lunch pastries (usually a pizza type pastry, spinach pastry or cheese pastry). All of the pastries and bread were fresh and still warm. They have a nice parking lot for your rental car, and free wifi that worked pretty well. It's a couple of minute drive into Leonidio, or down to the beach. We'd stay there again - highly recommended. In fall 2017, the cost was €65 a night (except Friday nights are €75). The majority of people staying there during our visit were climbers. They have a few copies of the local guidebooks which you can borrow. The local guidebook is a very good source of info on places to stay, restaurants, markets, rest day activities, etc. If you can buy it online prior to your trip, it will answer a lot of questions for you. The beautiful little houses at Agroktima, where we stayed. Here is some info on a few other options. Archontiko Hatzipanayiotis - This is a sort of upscale hotel right on the main road in the center of town. We didn't go inside, but it looks nice and we heard it was nice from other climbers. The owners/managers are climbers. It's easy to walk anywhere in town from here. A little pricier than Agroktima, but they do offer reduced rate deals sometimes. Smyros Resort - Located in the village of Poulithra, about 8 easy kilometers south of Leonidio. Gorgeous location on the water. We didn't talk to anyone who stayed there, but it looked very nice. There are some good restaurants in Poulithra. Another relatively high end place for the area. Airbnb - there are many locals who offer rooms and houses for short term rentals. This is a good option if you are on a tight budget or are coming for a long term stay. An internet search will reveal many other options. Given the growth of climbers as a year round source of tourism dollars, I would expect more places to stay will appear every year. Leonidio is a town of about 3500 people. It is located in the valley of the Dafnon River (the river is dry much of the year) about three kilometers from the coast. Between the town and the coast is a flat river delta that is filled with farms growing eggplants, citrus, tomatoes, peppers, olives, pears, apples, chestnuts and more. There is little commercial development in town - no chain stores or restaurants. Climbing is a new source of visitors and the town has embraced climbing and climbers. You will see signs directing you to the climbing sectors all around town and at some of the major intersections. In town there are a few gas stations, a couple of small markets, bakeries, pastry shops, and a few specialty stores. More on restaurants below. The roads are narrow in town, and many locals get around on scooters, which they drive at a crazy pace. It's not uncommon to see people texting on their phones while zipping their scooter thru town. Drive with care and get a small car. The locals are very friendly and helpful, though many do not speak any English. There is a local climbing shop in town, the Panjika Co-op. It's located a block off the main street and has beer, coffee and great snacks. This is a good place to meet other climbers and hang out at the end of the day. They have a small gear selection (ropes, quickdraws, etc). You can also get the local guidebook here (€27, published in fall 2016). They host live music most Saturday nights. There is a free public parking lot along the river, about a block south and below the center of town. This is the place to park when heading into town for shopping, restaurants, or hiking to the closest climbing sectors. Parking along the main residential streets of town is not recommended. There are maybe 15 or 20 restaurants between Leonidio, the Plaka (beach area) and Poulithra (8 km south). Here are a few of the places we frequented. En Leonidio, 1904 - This is a pizza/Italian restaurant in the center of town. They have fantastic greek salads, but otherwise all Italian food. Good food, good atmosphere and good prices. Really nice outdoor patio. Probably our favorite place, mainly due to the quality of the salads and pizza, and the good vibe. Popular with climbers, who made up the the majority of the customers each night. Michel and Margaret's - Located in the plaka, Leonidio's small harbor. Here you can sit outside on the covered patio overlooking the harbor. Margaret the proprietor will greet you and tell you all about the menu options for the night. She may also bring you some fruit from her garden. Good seafood, lamb and fantastic fried potatoes. Myrtoon - This place is located in Poulithra, south of Leonidio. It's a nice easy drive along the coast, and well worth a visit. This restaurant is located right on the beach. You can enjoy a meal while watching the small waves crash along the pebble beach just a few meters away. Very good seafood, and a large menu with something for everyone. Leonidio Market - Every Monday morning there is a public market in the square across the river from the public parking area. This has a great selection of local produce at fantastic prices. It's not a large market - maybe 20 to 30 vendors in total. Most vendors had a variety of types of produce, but a few also had fresh seafood. Well worth a visit every Monday. Looking down into Leonidio on the descent from the Aresos sector. The red limestone above town is the site of some great sectors, and a number of 6-8 pitch routes which climb to the rim. Hiking through town up to the Orama sector. This road is also the route to get through town and drive up to many sectors along the road to Vaskina (Aresos, Twin Caves, etc). Don't miss the market, held every Monday morning, just across the river from the public parking area. 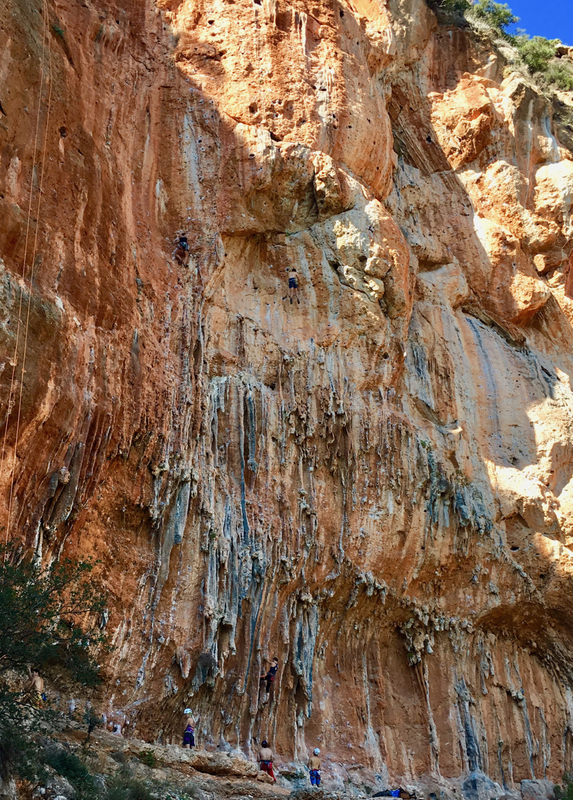 Leonidio has been developed to be a limestone sport climbing paradise. Most sectors are generously bolted, with routes sometimes tightly spaced. Many routes terminate at 35 meters to make it easy to complete with a 70 meter rope. A few sectors have routes up to 40 meters. In those cases an 80 meter rope is needed (or two ropes). We had only 70 meter ropes and had no problems. It is not uncommon to have 13 to 15 bolts on a 30-35 meter route. The first two or three bolts are usually closely spaced and very close to the ground. It is common for routes to have extensions - one set of anchors, and then another set of anchors higher up. Usually an extension involves 3 to 5 more bolts, and has harder climbing than the lower part of the route. The style of anchors varies from sector to sector. Most are rings, but some have carabiners or hooks to make the lower off more convenient. 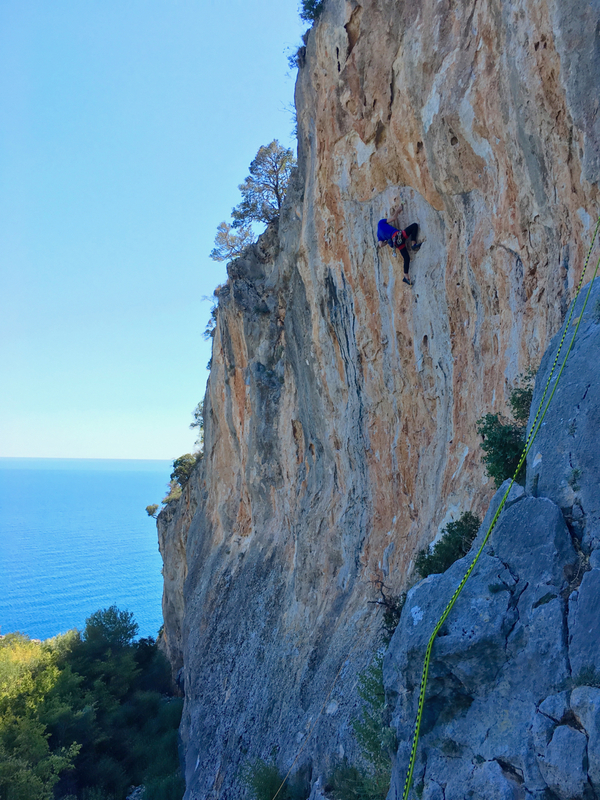 The climbing in Leonidio spans the grades from 5a to 8c+ (5.6 to 5.14+). Anyone who climbs consistently at 6a (5.10a) or above will have hundreds of routes to choose from. Some newer guides to Leonidio have upgraded the ratings of many routes from the local guidebook. We found the ratings to be pretty consistent with the USA, although for many new routes the ratings were inconsistent. Rock quality is mostly very good, but there are plenty of new sectors with some loose rock, and some routes with very sharp rock and holds. Here is some beta on a few other sectors we frequented. We climb at a moderate level (6c+ and below / 5.11 and below). This list represents only a small portion of the climbing in Leonidio. New sectors are constantly in development, typically 150+ new routes every year. The potential for new crags and long routes in the valley is mind boggling. The website Climb In Leonidio keeps a fairly up to date list of sectors and routes. The site also has other general info that will be helpful. Aresos. A very nice sector with some high quality route in the 6b range. This sector has only 12 routes now, but has a good view, a nice, roomy spot to hang out, and high quality rock. Several of the routes have extensions. The best routes here are Terpnon, Agroktima and Vervesos. All three are about 6b, and have steep, pumpy climbing for the grade, and excellent rock. Dornroschen. Twenty plus routes on a wall that gets early morning shade, and afternoon sun. Easy approach and mostly very good rock. 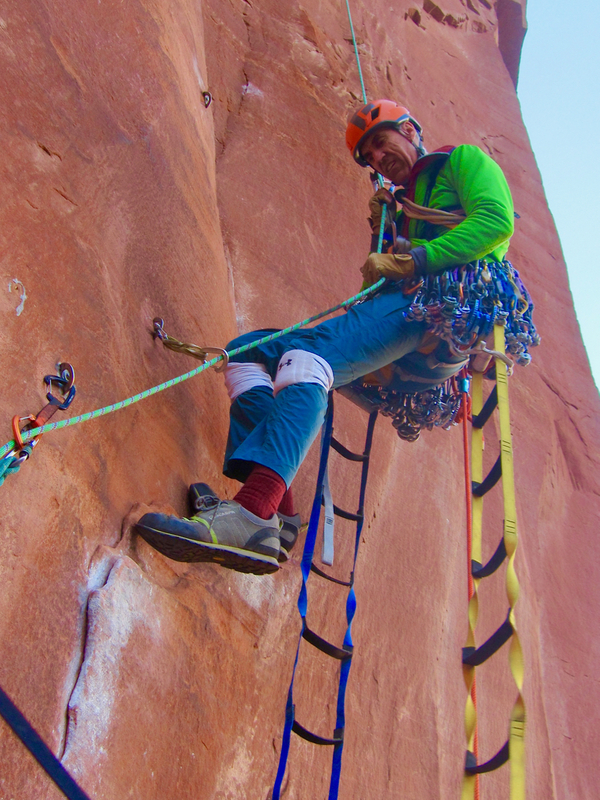 Some routes here are thin slabs with small holds, while others are steep and full of jugs. Good variety. A favorite route here was Nichts Its Mal Eben - steep climbing on an exposed arete (6b). Douvari. This sector is on the rock directly above town, and is reached by a steep hike leaving from the center of town. Expect to hike uphill for 20-25 minutes. A very popular sector for it's high density of fairly easy routes, and general good quality. Many routes have long extensions that add steepness and difficulty - so it's easy to climb here with people of variable ability. Routes here are closely spaced (sometimes only a few feet apart) and very well bolted. Elona. High up in the Dafnon river valley, about 30 minutes drive from Leonidio is this crag and the adjacent Elona Monastery. Don't miss it, well worth a visit. This is a higher, cooler, mostly shady crag, great for warm days. Mostly very steep and high grade routes (7a to 8c+). Frydi. This small crag is located along the road to the Saint Nicolas Monastery. The rock looks great, but we found this to be the most disappointing crag in Leonidio. The routes are mostly contrived, with odd bolt placements, and not very enjoyable climbing. Do yourself a favor and skip this crag. King of Thrones. A cool, shady wall great for warm days. You could climb at Dornroschen (which is directly along the approach just a few minutes before this crag) in the early morning, then move here later for a full day in the shade. Good, steep routes here from about 6b to 7c. Orama. This crag was developed in 2016 and was still undergoing some development when we visited. The trails to the routes are new, and some still need some work. But the rock quality is superb and the number of quality routes in a small space is amazing. About 40 routes here (mostly 6a to 7a), plus extensions. This wall faces south, and is best for cool or shady days. Many routes here are a considered a bit underrated in the original 2016 guidebook, and have been upgraded in a more recent Greek guidebook. A few of the superb quality routes include Nightfall (6b), Marauder (6b) and Kapari (now given 6b+). Mad Wall. A very good quality wall with many moderate routes. Fairly easy approach and good view of the sea. Generally very warm and sunny. About 20+ routes, mostly 5b to 6b+. A couple of good flat spots to hang out underneath olive trees. Check out B2, Aerostato, Koukoutsi, Tsibouki, I am a Hero and Don't Panic. All good routes in the 6a to 6b+range. Mars. Probably our favorite crag in Leonidio. A 30 minute hike to a relatively remote location, gets you to this fantastic crag. Gorgeous tufas, superb rock, and even more superb climbing. The crag has morning sun and afternoon shade and can be crowded. Routes are from 6b and up. Many are quite long and steep. All the routes we did were excellent. The left side of the crag is smoother, less steep and is without tufas, but still superb quality. If you have time, plan to spend at least a few days here. Rocspot. This crag is located above town, directly between the Orama and Douvari sectors. About 20 mostly high quality routes on excellent red limestone. Primarily 6a to 7a. Sabaton. A new sector located on the road out of town towards Athens. It is still close to town and has super easy access and all day shade. In late 2017 there were 57 routes. Some are excellent quality - some not so good. Many routes are still cleaning up and will likely be even better in the future. Well worth a couple fo visits. Saint Nicolas. This is a striking and beautiful valley located above town, and home to another spectacular monastery. The most striking thing about this valley is the road and drive up to the climbing. The road here is exceptionally steep, narrow and exposed. Not a drive for the faint of heart. It can be negotiated in a normal, small car, but you had best be very comfortable with a manual transmission on a very steep road. Once you arrive, there is plenty of parking at the monastery. The valley has climbs on both sides of the canyon, and is a beautiful locale. We had troubles with the many goats in the valley kicking off loose rocks from above the cliffs. Beware and wear a helmet. Some great routes we sampled were Tado (6b) and Mono-ton (6c+). Skiadhianiko. An excellent crag located up canyon, below Elona. This crag has a nice approach trail and has a good variety of routes - steep, long routes and short slabby routes. Very good quality rock. Twin Caves. Located well above town on the road to Vaskina, the Twin Caves are another favorite. To the left of the caves is a wall with about a dozen excellent routes from 5c to 7a. The super classic Avgi (6b+) was our favorite. Also good were Gumbo, Tsibouri and Nanaki. The main cave features another 20+ steep and gorgeous looking routes, mainly 7a to 8b+. Climbing tufas at the Mars sector. Afternoon shade and fantastic quality climbing. Another view of the Mars sector. To the left, out of the photo, are many routes that climb steep, smooth rock, but without the tufas shown here. The newly developed Sabaton sector. This sector has some good routes, and some that need more traffic to get cleaned up. The route shown here is a superb 6b+ route on mostly huge holds. Karen hikes through the canyon of Saint Nicolas. 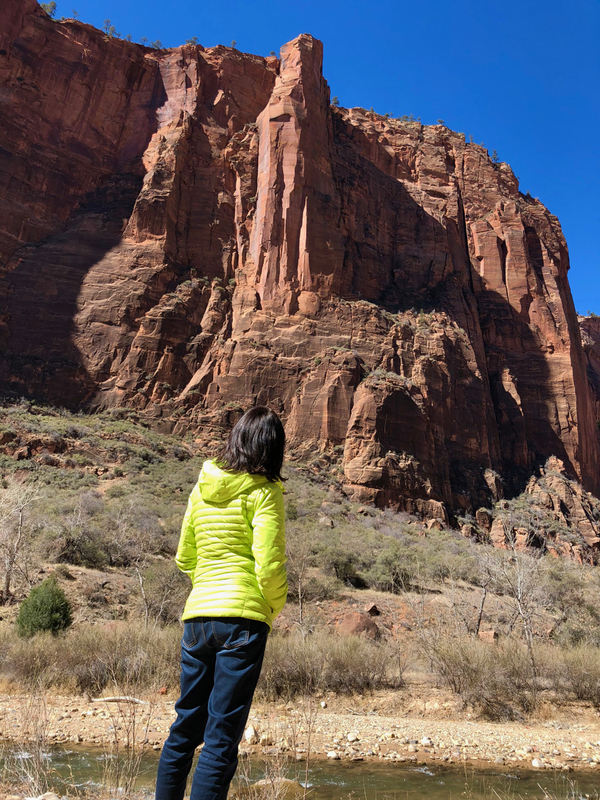 This is a lush and beautiful canyon that is worth the visit for the climbing, the hiking, the striking monastery, and the exciting drive to and from town. Karen at the Mad Wall - a warm, sunny wall with a great view. Another view of the Mad Wall. The tufts of grass and some vegetation don't interfere with the good climbing here. Well worth a visit for a good selection of moderate climbs. Frogland is a classic moderate route in spectacular Black Velvet Canyon. As advertised, it has quality climbing, lots of diversity, and decent exposure. You get thin face climbing, lots of good finger and hand cracks, and even a short chimney that is loads of fun. Belays are pretty good and the down climb is easy by the standards of Red Rock - about 30 minutes of scrambling takes you right back to the base of the route. With all those features, it's crowded. We climbed it on an OK day in April, and I think there were 4 or 5 parties on it that day. We got there pretty darn early, but still were second in line, and had to wait a bit for the slightly slower party above us. Highly recommended route if you don't mind sharing it with others. Karen heads up the second pitch of Frogland. An excellent long pitch with a couple of bulges to navigate. Cruising up the third pitch. A great view of Black Velvet Peak from the summit of Frogland.